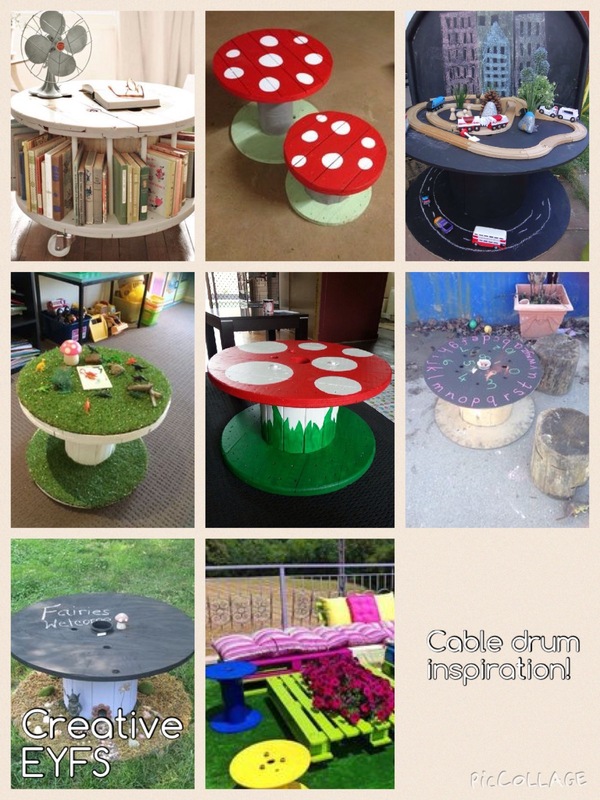 I have seen so many exciting ideas of how to transform cable drums into key pieces of furniture within learning environments. However so many people ask me where to get cable drums from, if you are lucky to have a friend who works and uses cables then that is great, however like me, that is not the case, so if you have building work going on over the holidays in school, ask your caretakers to save the cable drums that they use for electrical work! This was my stash from last year! I have used the drums as part of our outdoor provision allowing children to construct or as ABC says deconstruct! Lately I have turned them into small world tables where dinosaurs roam free, or fairies have tea parties! I also use them to display different objects as well.